Due to the large number of requests we have added a Junior page to gather local and national tennis news. For the next weeks we will simply add news and by the Spring we will cover all facets of tennis for the juniors of San Francisco. Please feel free to send John any requests for topics, subject or announcement that will serve local Juniors. WE NOW HAVE TIPS FOLLOWED BY LATEST NEWS. 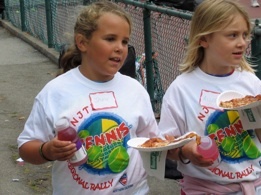 Until December 31, 2012, kids 10 and under, new to the USTA, can receive a FREE Junior Membership-a $19 value! Sign your kids up now or bring them to the USTA Membership booth near the US Open American Express Fan Experience to join. It’s Easier Than Ever To Play At Home! Play 10 and Under Tennis at home this winter – no courts are necessary! Using slower-moving and lower-bouncing balls and equipment sized right for their size, kids can play right away and stay active. 10 and Under Tennis makes it easier for kids to pick up a racquet and have fun—and it's easy to play in your driveway, garage or basement! The equipment is easy to set up and tennis is the perfect sport for your entire family to enjoy together. Go to 10andUnderTennis.com for more information. The USTA announced details of its “Give the Gift of Tennis” holiday campaign that will encourage fans to match young tennis players with properly-sized tennis racquets, and with proper compression balls. The campaign includes the USTA’s first promotional sweepstakes on Facebook where fans can win free equipment and the chance to play tennis with new U.S. Davis Cup Captain Jim Courier. The campaign begins December 1 and continues through the holiday season. The objective of the “Give the Gift of Tennis” campaign is to promote playing tennis at home – no courts are necessary. With modified equipment, you can just as easily play at your local playground, driveway, cul-de-sac, or even in the back yard. The equipment is easy to set up and perfect for an entire family to enjoy together. 10 and Under Tennis is designed to get kids into the game immediately, so that within the first hour, they can actually be playing. Scaling the game down to their size helps make the learning process substantially easier and more fun. In addition to the “Give the Gift of Tennis” campaign, the USTA is also launching a tennis equipment sweepstakes via the USTA’s Facebook page. Each day from December 1 through December 15, the USTA will give away 50 kids-friendly tennis packages that will include two 21-inch tennis racquets, two 23-inch tennis racquets and six red foam tennis balls, to highlight the USTA’s new approach to teaching the sport of tennis to younger players. In all, 3,000 racquets and 4,500 balls will be given away this holiday season. In addition, one lucky fan will also win a grand prize – the chance to play tennis for one hour with new U.S. Davis Cup Captain Jim Courier at the USTA Billie Jean King National Tennis Center. The total retail value of this promotion exceeds $50,000. Each November, along with countless other student athletes, the country's top tennis-playing high school seniors determine their collegiate futures on National Signing Day. Among the players from the class of 2011 who have committed to colleges include reigning USTA Girls' 18s National Clay Court Champion Caroline Price, the daughter of former NBA All-Star Mark Price, who has signed with the University of North Carolina. A number of blue chip boys have committed as well, including Mitchell Frank of Annandale, Va. Frank, who at one point this year was ranked No. 5 in the ITF World Junior Standings, will join last year's No. 1 recruit Alexander Domijan at the University of Virginia. John McEnroe has already surpassed his initial aim for his latest venture, his own tennis academy based at the SPORTIME Randall’s Island Tennis Center in Manhattan, New York with over 400 students enrolled. 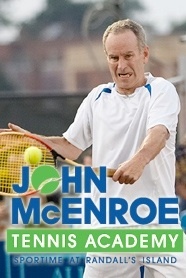 The John McEnroe Tennis Academy officially opened its doors the day after the U.S.Open concluded, on September 13 and students are attending from New York City’s five boroughs, as well as Westchester, Connecticut and New Jersey. Former Israel Davis Cup player Gilad Bloom as the Director of Tennis with a team of 30 instructors including McEnroe himself who works on a daily basis when his television and Champions Tour commitments permit. The former world no.1’s younger brother Mark has taken the role of Academy Director and revealed there is a waiting list of new candidates is currently being compiled for admission in 2011. “The initial response from students of all levels has been very positive, and we are already seeing a level and depth of talent and interest that we always believed was there, and is now being demonstrated,” said Mark McEnroe. The Academy approach encourages students to live at home, continue their individual schooling during normal school hours, and to participate in extracurricular activities other than tennis, just as McEnroe did in his formative years. Students have access to classrooms, a computer lounge and other amenities for down time between school and Academy sessions, and after Academy sessions and transportation is provided for in many instances. SPORTIME serves over 25,000 tennis and sports members, including close to 10,000 junior tennis players, and employs over 1000 individuals at its 13 tennis and sports clubs across New York State. Randall’s Island , located just off the East Side of Manhattan below the RFK Bridge, was designated the flagship facility with 20 courts, including 10 Deco-Turf hard tennis courts 10 Har-Tru clay courts, five indoors. Stanford sophomore Mallory Burdette recently took time to answer questions about her outstanding freshman year, why she chose Stanford, what it was like to become an overnight YouTube star after clinching the NCAA title last year and much more. Burdette will be teaming with senior Hilary Barte at the upcoming USTA/ITA National Intercollegiate Indoor Championships, which will be held at the USTA Billie Jean King National Tennis Center in Flushing, N.Y., from Nov. 4-7. 10 and Under Tennis is based upon the QuickStart Tennis format and like Little League Baseball and other youth sports such as soccer and basketball. These youth sports employ smaller equipment and fields/courts so that kids can achieve success the first time out—and sustain that success every time they play. By using equipment sized right for them, kids learn quickly, develop better technique and love the game for life. 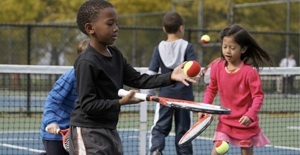 Beginning January 1, 2012, all USTA-sanctioned tournaments for children 10 and under will use smaller courts with lower nets, lighter and lower-bouncing balls, smaller and lighter racquets adjusted to a child's size. USTA Northern California is currently working with facilities and tennis organizers all over the section to support new 10 and Under Tennis events, programming and blended lines. Details. Like it or not, we are a society of rapid change and the rate we effectively adapt to that change can make the difference between a good and great experience. The same holds true in college athletics recruiting. The question is: How do we come to grip with this rapidly mounting culture shock in the college quest for athletes? Today’s college athletic climate is much different than it was 30 years ago. Coaches are under tremendous pressure to achieve two important goals: win and raise money. The one directly affects the other and successful recruitment is the college coach’s key that unlocks the door. The college search for athletes has accelerated to new heights compared to 30 years ago when I was a two-sport prospect. It has become a “force” that needs to be understood, accepted and embraced if families and young athletes plan to grab the brass ring and reach their goals. This new culture has effected the majority of today’s prospects and families largely and simply because it is “new” and for the unprepared visitor, it can be a bewildering and frustrating journey. Gaining a working understanding, for instance, of the current NCAA rules is one thing. An altogether different skill to hone is to understand how each individual college coach “ticks” and where you, as a prospect, register on the radar. Remember, even the slightest “misread” while communicating with college coaches, could derail a prospects recruiting plan. Is this an exaggeration? I do not think so. Am I trying to drive fear into recruits and their families? No. I am just trying to get your attention! That said, if we embrace the change around us, along with the acceleration that the college recruiting process has reached, we at least get a clearer idea of the “real” landscape and with that, we position ourselves better to develop more accurate plans of attack. Gathering information is critical to the successful organization and navigation of any worthy project. Building a college recruiting information base can begin as early as the ninth grade as a family hobby and increasingly grow into a highly organized, disciplined project by the end of the junior year. Start by gathering information on potential colleges of choice including team and coach profiles, statistics, ranking, and academic offerings. Continue to update and maintain individual e-files on your favorite college programs. Learn the NCAA rules as it applies to recruiting and eligibility (you can access the NCAA college manuals at: www.ncaa.org). Remember, an informed and educated consumer will have the best chance at success. Effective communication between the family and college coaches is an important component in determining your final college choice. If your mission is clear, the manner in which you communicate becomes the vehicle that drives your plan forward in your chosen direction. On the other hand, ill-prepared communication can cause confusion and misdirection. Your ship moves, but with a weak rudder. Communication should be initiated early on by the family, and preferably by the prospect. Coaches are bound by very strict contact rules, but a prospect may call or e-mail a coach at any time, with rare exceptions. An initial letter of introduction is a great way to begin, but follow-up by e-mail and by phone is equally important. The point here is simply: Prospects who practices “persistence with respect” when communicating with coaches will have a better chance in grabbing their attention. I believe many prospects are under the assumption that the college coaches will routinely contact them by phone or by e-mail in an attempt to recruit them. This may be true for some prospects, but for the majority of athletes who are waiting for the phone to ring, it could be a long wait. Coaches are initially recruiting hundreds of prospects and need to utilize a filtering system to organize their list into a manageable and functional grouping. Whether you communicate by phone, email or face to face, “preparation” is the operative word. When you are well prepared to communicate with the college coaches, your level of self confidence increases, your communication has “grip” and the coaches sense this. Remember, college coaches are certainly looking to attract the best student-athletes, but just as important, they are looking for self aware individuals who bring potential leadership skills to the table. College coaches are under tremendous pressure to not only manage a successful athletics program, but to win consistently and often. In short, college athletics is big business and the head coach is seen by his AD as the CEO of an organization that must succeed. That being said, I think it is important for folks to get a glimpse of the head coach from a mental and emotional standpoint and make an effort to get inside their heads! Coaches and recruiting coordinators work tirelessly to prepare for each new recruiting cycle, sometimes years in advance. They have to. Competition for the top scholar-athletes is fierce. Simply put, the better prepared and persistent the coach is, the greater the chances of matriculating a winning class. The volume of information that college coaches receive annually is overwhelming and growing. They not only need a system to filter all of this stuff, they need help from the prospects and families. Whether it is submitting your introductory e-mail with profile attachment of initiating phone contact with Coach about a pending tournament, the rule of thumb is simple: Keep it short, sweet and make sure your communication has value. Gaining an understanding and appreciation of the ever changing college athletics climate is essential to a productive college quest. As daunting as this “culture shock” may appear, there are resources that surround us that will help us understand this accelerated change in college recruiting. By taking a grounded, educational and persistent position in building and executing a well designed plan of attack, we give our boys and girls the best chance at success. Tom Kovic is a former Division I college coach and the current director of Victory Collegiate Consulting, where he provides individual advisement for families in college recruiting. For further information visit: www.victoryrecruiting.com . Let me confess at the outset that I'm a lunatic for doubles. I'm absolutely crazy about this great game. I love the team thing. I love two guys out there working together. Pumping your partner up when he is down. Patting him on the back and giving him an enthusiastic congratulations on a great shot. High fives. Walking on and off the court together. Celebrating a win together. Consoling each other after a loss. Watch a doubles match and you will always see more smiles. Way more smiles. You'll see more laughs. Way more laughs. Erlich armpit. The crowd roars its approval and the Bryans do a huge chest bump high in the air as they close out the first set. Could you follow that? Probably not and it all happens so fast on court. Sometimes fans have trouble watching it and believing their eyes too. It is all so lightening quick. Big volleys at point blank range. Thunderclap overheads at point blank range. Guys getting hit. Guys making breathtaking reflex volleys. Go watch Leader Paes volley. Watch Mike Bryan return and make crisp volleys. Watch Bob Bryan serve and hit running forehand full-swing terrifying volleys. Watch Mark Knowles hit beautiful touch volleys and also that solid inside-out backhand return. Get up in the front row and watch Jonas Bjorkman and Mahesh Bhupathi smack two handed backhand returns. And watch Danny Nestor slap his slinky and scary second shot ground strokes and his nasty lefty serve in the ad court. You think Fabrice Santoro is a magician on the singles court? You should see him on the doubles court, where he has two additional alleys of nine feet of court with which to work his diabolical sorcery. You think Max the Beast Mirnyi looms large on a singles court? Go watch how he can fill up a doubles court with his big serve and overheads. Wonder where serve and volleyers are today? Go watch a doubles match. Serve and volleying is alive and well there. You'll see countrymen playing together. Friends playing together. Players from different parts of the world playing together. You'll see two players of different and perhaps contentious religions playing together. Doubles is a unifying and powerful force for world peace for crying out loud! -- It gives them a second chance in tournaments. -- It will round out their skills. -- It teaches additional life lessons. -- It is more social. -- It's a way of getting four people on a court rather than just two and at a club with just a few courts, that helps. -- It broadens the overall appeal of the sport. -- And you'll find there are certain kids who just like doubles better and will be involved in tennis because of it. I think that with the proper promotion and programming for doubles we could quadruple the number of juniors and adults playing this game world wide. Again, people like the team aspect and the great points in doubles. They like the exciting and new slightly shortened scoring system -- no ad and a third set super tie breaker. Lots thrills, chills and adventure as my friend and the legendary Billie Jean King would say. By the way, BJK loves doubles and loved to play doubles. Here favorite part of a Davis Cup tie is the Saturday doubles. And hey -- I love women's doubles and mixed doubles too. And remember: We are the only sport that has men and Women competing together. We need to cherish and sing the praises of that too! And you can talk about sexual equality or gender equity all day. Or you can just go watch a mixed doubles match and bang! There it is right in front of your eyes. The ATP has done a wonderful job these past few years of pumping up doubles. They are promoting the best teams with posters and cards. They are covering doubles beautifully with pictures and articles on their great web site. They are putting lots more doubles on Center Court and in prime time. They are posting doubles draws and doubles rankings at each tournament. The tournament program has articles and pictures of the top doubles teams. More singles stars like Rafa Nadal play doubles now on a regular basis. There is a lot more doubles on TV and special thanks to the Tennis Channel for that. And I say thanks to the ATP for putting out this great new book on doubles. Enjoy reading it and looking at the great pictures. And good luck in your next doubles match. To purchase Bryans book Raising Your Child to be a Champion in Athletics, Arts and Academics go to Amazon.com http://www.amazon.com/Raising-Child-Champion-Athletics-Academics/dp/0806526602.